The Bismarck Tribune is a Pulitzer Prize-winning daily newspaper serving a large portion of central and western North Dakota, with a circulation second in the state only to the Fargo Forum. Its first edition was in July 1873. While it was not North Dakota’s first newspaper, it is the state’s oldest surviving periodical. In its early years, The Bismarck Tribune crossed back-and-forth between a daily, tri-weekly, and weekly publication. It wasn’t permanently a daily periodical until April 1881. A weekly edition continued jointly until the 1940s. The paper has been housed in at least five different locations throughout the years, three of which were destroyed by fire. It has operated from its current facility since 1980. 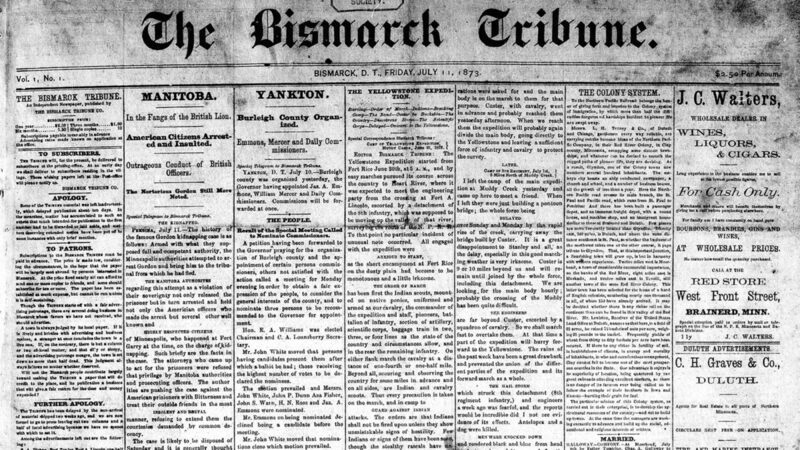 The Bismarck Tribune’s first edition was printed July 6, 1873 with a July 11 dateline. Perhaps the most notable headline from its first edition proclaimed “Burleigh County Organized.” Bismarck itself was barely a year old. Colonel Clement A. Lounsberry, previously an editor for The Minneapolis Tribune, founded The Bismarck Tribune, which was first produced using a small cylinder press capable of outputting one copy per minute. Charles Lombard and Mark Kellogg were also on-hand for the first edition. July 4th was the intended target date for the first edition, but the presses were delayed in shipment. Lounsberry took great responsibility in managing The Tribune, viewing it as an important asset in growing Bismarck. In fact, it did. Tribune reporting of nearby gold discoveries in 1874 brought a quiver of prospectors, despite an 1868 treaty reserving the sacred Black Hills for the Sioux. The Bismarck Tribune received widespread national attention in 1876 for reporting on Custer’s Last Stand at Little Bighorn, an event that lead to the death of reporter, and Tribune co-founder, Mark Kellogg. As an agent of the Associated Press, Kellogg is considered to be the first AP reporter to have been killed in the line of duty. Lounsberry sold the Tribune in 1878, about two years after accepting the job as Bismarck’s postmaster. Lounsberry returned to the helm the following year. He divested the paper again in 1883. The Bismarck Tribune won a Pulitzer Prize in 1938 for a series of articles called “Self-Help in the Dustbowl”. The Tribune’s original location is unclear. It may have been in the same location as that destroyed by fire on March 6, 1885. It was a shared framed building on the south side of the 200 block of Main Avenue, about where Zimmerman’s Clearance Center now stands. The paper moved to the 300 block of Main Avenue in what was the original Webb Building. That location, too, was destroyed by the August 1898 Fire. It was temporarily housed in the Settler plant until a permanent location could be secured. 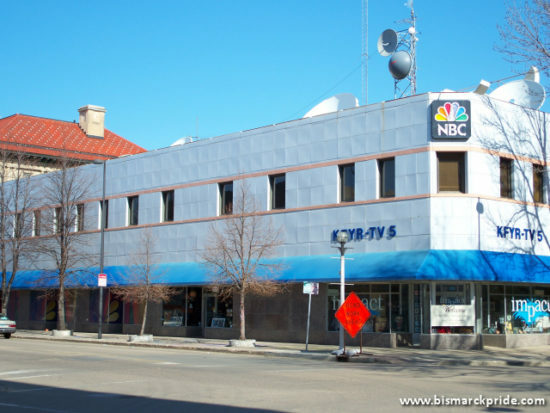 The Tribune commenced construction of its new headquarters housing a “first-class modern print shop” on the former Mellon lot, on the northwest corner of 4th and Broadway (now KFYR-TV). 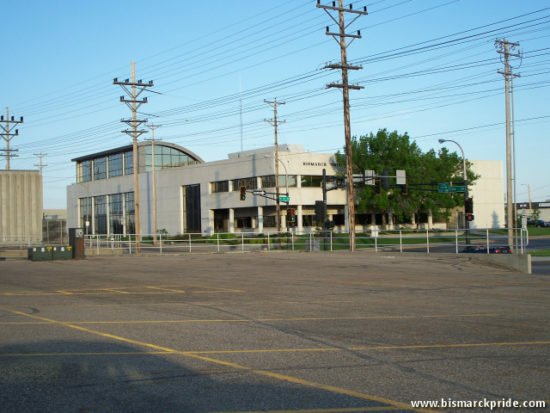 The lot was purchased form the now-famous Mellon Brothers, who were early investors in Bismarck. The building was remodeled and expanded to the north about ten years later. By December 1919, the Tribune had outgrown the building and moved again, this time to the Gussner Building on the southeast corner of Main & 3rd. 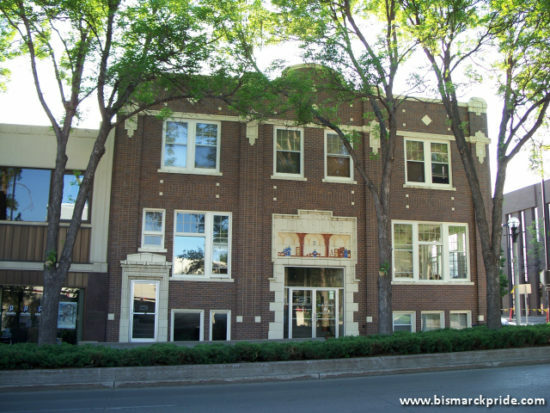 At the time, it was the oldest remaining brick structure in Bismarck. That is, until destroyed by fire on January 21, 1920. It was the third time fire destroyed the paper’s home. It was then that the Tribune constructed its long-time home at 224 N 4th, on the southwest corner of 4th and Thayer, which was completed later that same year. A second building was later built to its immediate west. It remained there until relocating to its present building, on the southeast corner of 7th and Front, in July 1980. The new headquarters were constructed on the former Peavey site for $3 million.